In the Duet Wifi box there's a bag of connectors. Most of these are 2 or 3 pin connectors (like regular fan connectors) and their purpose is clear. However, there are 8 additional connectors - namely: 2 larger black & red, 2 smaller black & red, and 4 very small white - whose purpose I'm not entirely clear about. Are these some sort of crimp connectors for the power sockets on the controller? Any explanation on these connectors, how to use them and how to hook them up would be very much appreciated! These are bootlace ferrules for any power connections using stranded wire. They may or may not work depending on your gauge of wire. Crimper is reasonable from Amazon. Uninsulated ferrules are great for connecting wires without solder! Nice handle, SnowCrash. Still one of my favourite SciFi books! I think I will read it again. Hi Nate! Thank you very much for clarifying this! Hi Zesty_Lykle! Thanks! Yeah, one of my all-time favorites too! bootlace ferrule crimps are really easy. Stick the wire in, and crimp. Not fiddly at all. The crimper just squishes the metal tube into a compressed shape to firmly hold the wire. I wouldn't recommend plyers though, they pinch it, but don't compress it tightly like the crimper does. 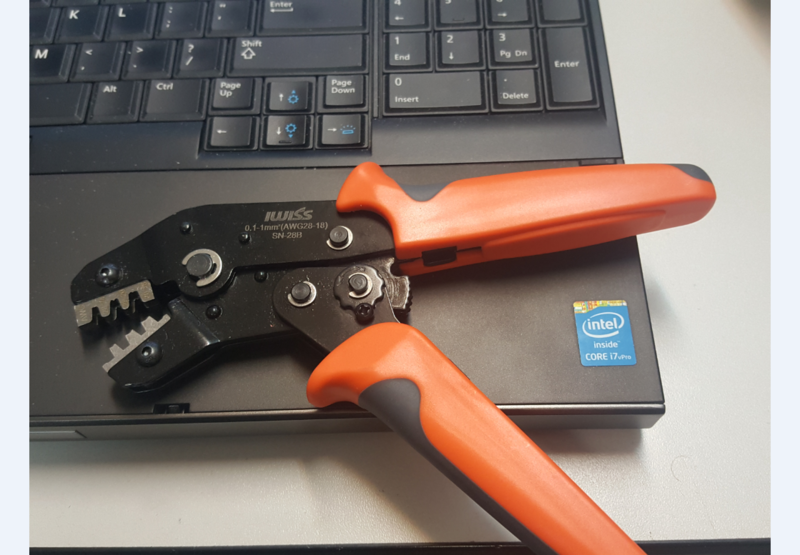 The HT225D crimper is suitable for the Molex KK compatible connectors and is widely available. Those connectors can be quite fiddly, especially if one has had too much coffee. It took me about 15 - 20 of them before I finally got a system down that let me do them quickly. You also have to be careful to make sure you are using the right AWG slot on your crimper or you can create very fragile wires that tend to disconnect at in-opportune times. Basically I use a pair of small needle nose to pinch the part of the connector that grips the insulation of the wire just enough that it won't fall off. Then I set it on the die of the crimper so that the insulation grabbing part is in the small side and the pin that holds it into the housing is on the outside of the die. Crimp, turn the connector around so that the part that bites into the exposed wire is now on the small side with the holding pin on the outside of the die and crimp again. I honestly have no idea if this is the right way or not; however once I started doing this I had professional looking, solid connecting, and non wire breaking connections that only took me 15 - 20 seconds per wire to do. This resulted in far less cussing and swearing as well. insert the molexkk crimp into the correct slot on the crimper and start to close it, just enough so that the crimp is held in place. The ratchet mechanism of the crimper holds the crimper at that point. insert the stripped wire so that the insulation is up to the central notch in the crimper. This makes the insulation line up with the larger part of the crimps and the stripped wire the smaller, tighter part. fully close the crimper so the ratchet releases. Perhaps this is part of my issue ? It has a crimp contact patch around 3mm thick, so I end up crimping the insulation retention and the contact crimps separately. 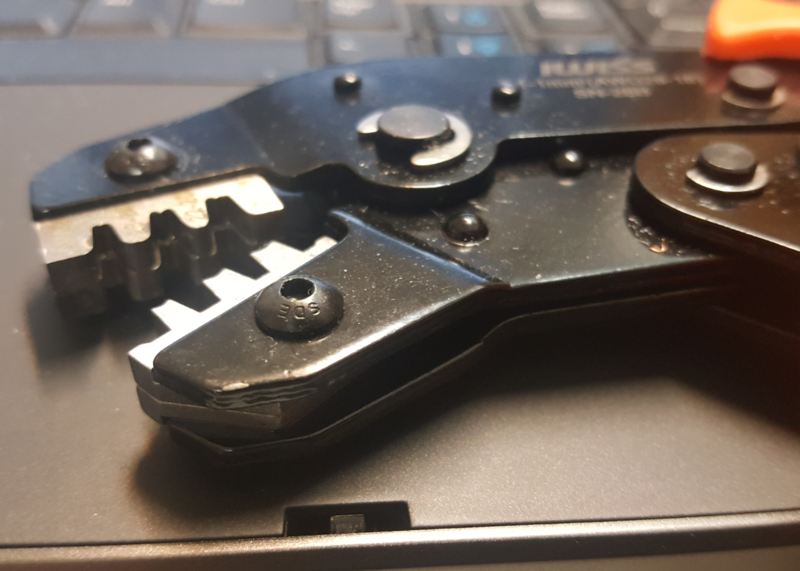 I have found that with the Engineer PA-09 crimper, it works best for me to just cut the strip that the little terminals are on between the contacts, bend the remaining tab down around 90°, and use that as a guide as to where the pin should rest in the crimp jaws. I have been using the Engineer PA-09 crimpers for the molex connectors and have had 0 issues. No cutting or snips or other pliers needed. Does take two crimps as Allen mentioned - crimp the insulation and then crimp then then contacts. I've got that same crimper - and once you figure out which direction and orientation to insert the Dupont pins/sockets in, it actually makes some solid crimps. I'll snap a couple of pictures of the way I do it when I get home today. It definitely took me a couple dozens of attempts to get it down consistently. Alright, got around to snagging some photos. I realized that I really don't have an account on a photo hosting site that's still around, so Instagram will have to do for the moment hah! Click the arrows within the picture to scroll to the different steps. Let me know if something doesn't make sense! Excellent work! thankyou very much.